2. ਬਾਕੀ ਤੁਸੀਂ ਕਹਿ ਰਹੇ ਹੋ ਕਿ ਸਾਨੂੰ ਸਮੇਂ ਅਨੁਸਾਰ ਬਦਲਣ ਦੀ ਲੋੜ ਹੈ, ਇਹ ਠੀਕ ਨਹੀਂ ਕਿਉਂਕਿ ਸਿੱਖੀ ਵਿਚ ਰਹਿ ਕੇ ਵੀ ਤੁਸੀਂ ਸਮਾਜ ਵਿਚ ਵਿਚਰ ਸਕਦੇ ਹੋ । ਕਈ ਵੀ ਇਸੇ 'ਬਦਲਾਓ' ਦੀ ਆੜ ਵਿਚ ਮੋਨੇ ਹੋਈ ਜਾ ਰਹੇ ਹਨ ਤੇ ਆਪਣੇ ਨਾਵਾਂ ਨਾਲ 'ਸਿੰਘ/ਕੌਰ' ਵਰਤਣ ਦੀ ਜਗਾਹ ਆਪਣੀ ਜਾਤ, ਪਿੰਡ, ਸ਼ਹਿਰ ਤੇ ਦੇਸ਼ ਦਾ ਨਾਂ ਲਗਾਉਣ ਨੂੰ ਤਰਜੀਹ ਦੇ ਰਹੇ ਹਨ । ਆਪ ਇਸ 'ਬਦਲਾਓ' ਨੂੰ ਸਹੀ ਕਹੋਗੇ ਜਾਂ ਗਲਤ ? ਜੀਵਨ ਜੀ ਦੇ ਪਤਰ ਮਿਤੀ 02-10-2004 ਵਿਚ ਸਿੱਖੀ ਪਹਿਚਾਨ ਦੀ ਗੱਲ ਕੀਤੀ ਜਾ ਰਹੀ ਹੈ, ਜੋ ਕਿ ਸਮੇਂ ਦੀ ਲੋੜ ਹੈ । ਕੀ ਜੀਵਨ ਜੀ, ਆਪਣਾ ਸਿੱਖੀ ਸਰੂਪ ਅੱਗਲੇ ਪਤਰ ਦੇ ਨਾਲ ਆਪਣੀ ਫੋਟੋ ਭੇਜ ਕੇ ਦਿਖਾ ਸਕਦੇ ਹਨ ? Thank you for your input and bringing up the issue of documenting the stories of victims from 1984 Sikh massacre. I will definitely bring you letter to the attention of United Sikh Federation, Baljit Singh Khalsa and a member of Punjab human rights. I would also like to take this opportunity to let you know that the plight of these writers and human rights activists is in bad shape. 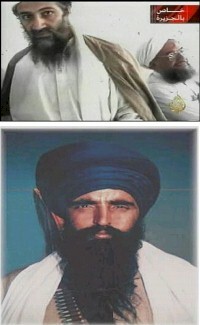 They are the true hero’s who have put their lives on line to document the darkest hours of Sikh history. Their is no help what so ever for these people to support them, they are working full time in collecting information and documenting and trying to find funds to get the documents published. They are disappointed by politicians and Sikh leadership, their families fear that they will have the same fate as Mr. Jaswant Singh Khalra. The only hope is god, and I pray that Sikh leadership have the guts to stand by our hero’s. ਅਮਰਿੰਦਰ ਦੇ 2 ਸਾਲ ਦੇ ਰਾਜ ਵਿਚ ਉਹ ਸਾਰੇ ਸਕੂਲ ਤੇ ਸਾਰੀਆਂ ਸੜਕਾਂ ਖਰਾਬ ਹੋ ਗਈਆ ਜੋ ਇਹਨਾਂ 5 ਸਾਲ ਵਿਚ ਬਹੁਤ ਹੀ ਪੱਕੇ ਕਰ ਕੇ ਬਣਾਈਆਂ ਸੀ.???? ਪੱਖੋਕੇ, ਸੇਖਵਾਂ ਅਤੇ ਲਂਗਾਹ ਮੰਡਲੀ ਦੇ ਕਾਰਨਾਮੇ ਵੀ (ਕਿਸੇ ਹੋਰ ਸਚਾਈ ਦੀ ਉਡੀਕ ਨਹੀਂ ਰੱਖਦੇ.) ਪਰੋਪੌਗੰਡਾ. ਅਮਰਿੰਦਰ ਨੇ ਜੋ ਪਾਣੀਆਂ ਦੇ ਬਾਰੇ (ਬੜੀ ਹੀ ਸਿਆਣਪ ਨਾਲ ਨਵਾਂ ਕਾਨੂੰਨ ਪਾਸ ਕਰਵਾਇਆ ਹੈ, ਇਹ ਕੰਮ ਇਹ ਕੌਮ ਦਾ ਲੂਣ ਖਾਣ ਵਾਲੇ ਕਦੀ ਵੀ ਨਾਂ ਪਾਸ ਹੋਣ ਦਿੰਦੇ ਜੇ ਕਰ ਇਹਨਾਂ ਨੂੰ ਪਹਿਲਾਂ ਪਤਾ ਲਗ ਜਾਂਦਾ, ਕਿਊਕੇ ਉਹ ਇਹਨਾ ਦੇ ਢਿੱਡ ਦੀਆਂ ਜਾਣਦਾ ਹੈ ) ਮੱਤਾ ਬਾਦਲਕਿਆਂ ਦੀ ਸਲਾਹ ਤੋਂ ਬਗੈਰ ਹੀ ਪਾਸ ਕਰਵਾਇਆ . ਵਿਦੇਸ਼ਾਂ ਵਿੱਚੋਂ ਅਪਣੇ ਗਰਾਹਕਾਂ ਤੋਂ ਉਗਰਾਹੀ ਕਰਦੇ ਅਤੇ ਝੂੱਠ ਬੋਲਦੇ, ਇਹ ਹਨੇਰਾ ਬਾਦਲ , ਦੁਖਬੀਰ ਬਾਦਲ ਦੇ ਚੰਮਚੇ ਜਿਥੇ ਕੌਮ ਦੀਆਂ ਝਿੜਕਾਂ ਖਾ ਕੇ ਜਾਂਦੇ ਹਨ ਓੱਥੇ ਇਹ ਵੀ ਦੁੱਖ ਸਤਾਉਦਾ ਹੈ ਕਿ ਪਹੂੰਚ ਕੇ ਹਿੱਸਾ ਮੰਗਣ ਵਾਲਿਆਂ ਵੀ ਆ ਜਾਣਾ ਹੈ. Yuba City, October 2nd, 2004. Many individuals and Sikh organizations have been working tirelessly to have charges dropped against Gurpal Singh Gill, an Amritdhari Sikh Truck Driver from Yuba City who was treated brutally by Oregon Police trooper. This was the 17th incident in the last three years that Amritdhari Sikh trucker has faced similar situation. The incident of alleged police brutality involving a Sikh truck driver has shocked and outraged the Yuba-Sutter Sikh community. On September 1, Gurpal Singh Gill (44) left Yuba City for Tacoma (Washington) at about 8:30 am. Driving his Peterbilt truck, Gill was towing a refrigerated trailer loaded with produce. Gill has been driving for two years and this was his first to the Pacific Northwest. At about 4:45pm, about 10 miles short of Roseburg, he was stopped by a trooper of the Oregon State Police- Oregon's equivalent of the California Highway Patrol. "Near Exit 106, about 10-12 miles south of Roseburg, I observed a police car in my rear view mirrors. The car came alongside, then fell back and signaled me to stop, which I promptly did," says Gill. The car was driven by Oregon State Police Trooper Kevin Bennett. Gill said that Bennett came to the driver's side door and ordered him to open. Bennett then allegedly took out his pistol and ordered Gill to disembark from his truck. He told Gill he was under arrest for carrying a 'concealed weapon'- Gill's personal kirpan, a symbolic item which Gill carries as one of the 5 K's, ordained by the Sikh religion. To handle this situation many other Amritdhari Sikhs, carry a letter from the Stockton City council. This letter explains the concept of the 5 K's. Gill showed the police officer the letter which Bennett dismissed saying it had no relevance in Oregon. Gill said that Bennett then ordered him to lie on the ground face down. "He then pushed his knee into my back, handcuffed me pressing my face into the ground," said Gill. Gill's injuries on his face and shoulder are a testimony to the brute force inflicted upon him. Gill also complains of back pain. Gill was then made to sit in the police car while Bennett searched his truck. Meanwhile two other officers showed up. Gill was told he had been pulled over for a missing registration plate and pouring a liquid out of his truck. The two officers reviewed the video recording and subsequently released Gill. They took his mini-kirpan and gave him a citation. Department of Justice (Diane Schneider) and United Sikhs contacted the ACLU in Roseburg. The case of a concealed weapon was dropped but Mr. Gill continues to suffer from both physical and emotional trauma. The Sikh community needs to look for permanent solution to this type of problem. We need to seek for legislative solution to honor articles of the Sikh faith including the Kirpan so we do not waste our recourses on similar situations in future. We need to send copy of the documentary Mistaken Identity to all police departments in USA and make efforts to train different state and federal law enforcement agencies about Sikh identity and articles of Sikh faith. Also efforts need to be made to have Sikhism added to curriculum of schools districts, colleges, and universities as part of world religions and history courses. Mr. Gurpal Singh Gill would like to thank every one who helped him, including Sikh Coalition, Punjabi American Heritage Society, United Sikhs, Sikh Center of Bay Area, US Department of Justice, ACLU Roseburg, and the American and South Asian Media. Mr. Gill would also like to thank Sikh leaders, local community members, Sikh Gurdwaras and local Christian Church members for their emotional support. ਪਾਕਿਸਤਾਨ ਵਿਚ ਵਾਪਰੀਆਂ ਘਟਨਾਂਵਾਂ ਬਾਰੇ. ਗੁਰੂਦਵਾਰੇ ਨਾਲ ਲਗਦੀ ਇਕ ਇਮਾਰਤ ਜਿਸ ਵਿਚ ਯਾਤਰੀਆਂ ਦੇ ਠਹਰਣ ਦਾ ਇਂਤਜ਼ਾਮ ਕੀਤਾ ਜਾਂਦਾ ਸੀ ਜੌ ਕਿ ਇਕ ਵਿਦਿਆ ਕੇਂਦਰ ਹੇ. ਜਦੋਂ ਵੀ ਇਹ ਵਿਦਿਆਲਾ ਬਂਦ ਹੂਂਦਾ ਹੇ ਜਾਂ ਫਿਰ ਲੋੜ ਮੁਤਾਬਿਕ ਇਸ ਇਮਾਰਤ ਦਾ ਇਸਤੇਮਾਲ ਸਂਗਤਾਂ ਵਾਸਤੇ ਹੁਂਦਾ ਹੇ. ਸਿਖਾਂ ਦੀ ਮਂਗ ਤੇ, ਵਿਦਿਆਰਥੀਆਂ ਦੀ ਸਲਾਹ ਤੋਂ ਬਿਨਾਂ ਹੀ ਇਹ ਇਮਾਰਤ ਵਿਦਿਆਰਥੀਆ ਨੂਂ ਛਡਣ ਅਤੇ ਹੋਰ ਕਿਤੇ ਵਿਦਿਆਲਾ ਖੋਲੇ ਜਾਣ ਦਾ ਫ਼ੇਸਲਾ ਲੈ ਲਿਆ ਜਾਣ ਕਰਕੇ ਇਹ ਸਬ ਸਮਸਿਆ ਬਣੀ ਹੇ. ਹੁਣ ਆਪਣੇ ਵਿਚਾਰ ਸਾਰੇ ਦਸਣ ਦੀ ਖੇਚਲ ਕਰੋ ਜੀ. The Hindu Mandir Association (HMA) and Hindu Religion Organization of Austria (HRO) will be celebrating the Diwali Mela 2004 on 14 November 2004, from 11:00 to 17:00 at Lugner City, Gablenzgasse 5, 1150 Wien. Known as the ‘Festival of Lights’, this is the largest Indian festival celebrated in India and abroad. From modest beginnings in 1991, this annual event has emerged as one of the best attended Indo–Austrian cultural functions in Vienna, and indeed in Austria. We endeavour to make this event memorable and successful. As you may already know, all proceeds of this function go directly to the “Temple Construction Fund” of the Hindu Mandir Association. With our constant efforts and negotiations with the authorities, we are very hopeful of getting a plot for the construction of a Hindu temple in 2005. Your donations and contributions will help the Association build a beautiful temple in Vienna. The Association looks forward to your continued support by way of participation in the cultural programme. We are also looking for the best talents to compere the programme, with excellent skills in English/Hindi/German. We need three ladies and three gentlemen to cover the entire programme. To ensure that the programme is both entertaining and varied, and taking into account Considering the feedback from the audiences from previous years, we would like to restrict performances to only one item per group or artiste. Furthermore, since there will be many families with children attending, we request that the items/performances be both tasteful and dignified.most of the audiences do not appreciate any vulgar performances. We therefore request you to offer your best performance. The artists/performers who are interested in presenting items in the cultural programme or individuals interested in compering the programme should contact Mr. Niranjan Das, Cultural Co-ordinator (tel. 9249804, handy: 06991-9249804; Ooffice 2600-22463; Email: n.das@iaea.org). As per the decision taken by the Executive Committee, 15th October 2004 is the last date for accepting offers for participation in the Diwali Mela 2004. The following office bearers of the Executive Committee can also be contacted for any general information related to the event or activities of HMA /HRO. I have read Mr Ghuman Singh's letter about this book “Indian terrorism on the land of Punjab” written by Baljit Singh Khalsa residing in India. The efforts of United Sikh Federation, Baljit Singh Khalsa, and other organizations involved are commendable. I appreciate his views as he said There is a desperate need to document and restore the history of Sikh struggle or it will be lost and forgotten in ever changing face of time. While the subject has been touched by some non-Sikh Magazine/Newspaper Editors and impartial writers in the past, I wonder if someone has seriously documented all or most of the happenings. Now since even the present Prime Minister and sometimes ago SONIA GANDHI has voiced with concern about those unfortunate happenings (while mentioning about the Muslim massacre of Gujrat,) I think the climate is ripe to document the Delhi episodes, in a BOOK FORM. The most trustworthy compilation would be from a NON-SIKH writer or a magazine editor ( of repute), while witnesses of the most of the living victims are still available. I suggest that the foundation should float such invitations or query, thru Indian press and Internet. And the writer (s) may be offered a certain worthwhile remuneration to collect the facts. The publication (if full of facts and figures) will itself pay for its publishing expenses, as it will sell world wide like hot cake. Certain facts are probably available from the findings of the COMMISSIONS that have done investigations. Another important fact that could help would be the AKALI FACTION along with NDA opposition who are venturing to get even with the congress party. To me. it should not be a false propaganda, but a fact finding treatise. I am sure pictures of those heinous incidents are still available some where. If the book has problem for publication in India. it can be done in Malaya, Singapore, Canada, U.K. or USA. It better be in English, Hindi and Punjabi, so that every human being who has a conscience should read and benefit from the futility of such happenings. Just a thought to communicate to the Sikh intelligencia. On September 18th, 2004 in Toronto saheedi barsi at Malton Gurduwara Sahib was organized in memory of a great human rights activist, saheed Sardar Jaswant Singh Ji Khalra. Sardar Khalra was kidnapped by Police during early 90’s to stop him from collecting and documenting the atrocities taking place in Punjab against the people of the Sikh faith. Sardar Khalra used his pen to protest against the human rights violations in Punjab and his barsi was appropriately marked by releasing the Punjabi book “Indian terrorism on the land of Punjab” written by Baljit Singh Khalsa residing in India. 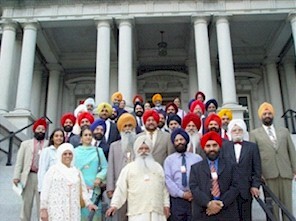 The efforts of United Sikh Federation, Baljit Singh Khalsa, and other organizations involved are commendable. There is a desperate need to document and restore the history of Sikh struggle or it will be lost and forgotten in ever changing face of time. The book released is a pensive effort to bring the horrible situation, of families who were tortured and humiliated, to the global platform. More such efforts are needed to be undertaken so that the shuttering voice of the victims can be converted into a strong slogan of peace and humanity. In past not much effort have been put into taking care of the children and women of those who died during the civil war like situation in Punjab, and such efforts would at least give these families a sympathizer to look forward to. Everyone should get a copy of this book so that the efforts of such writers and organizations do not go futile. Getting and reading the book is not only supporting the writer to finish the next document but also creates a wave of awareness about human rights violations taken place. i only like to say that first you do wrong work then simply say SORRY or FORGIVE US but what students do there is no forgiveness they will be punished so that they can learn the lesson and not doing such things again. Gursharan Jeet Kaur From Japan. ਨਨਕਾਣਾ ਸਾਹਿਬ ਗੁਰਧਾਮ ਵਿਖੌ ਸ਼ਰਾਰਤੀ ਅਨਸਰਾ ਵੱਲੋ ਕੀਤੇ ਹਮਲੇ ਇੱਕ ਦੁਖਦਾਇਕ ਘਟਨਾ ਹੈ, ਅਤੇ ਦੇਸ਼ ਵਿਦੇਸ਼ ਵਿੱਚ ਵੱਸਦੀ ਸਿੱਖ ਸੰਗਤ ਨੂੰ ਇਸ ਘਟਨਾ ਦਾ ਰੋਸ ਪੱਤਰ ਸਖਾਨਿੱਕ ਪਾਕਿ ਅੰਬੇਸੀਆ ਨੂੰ ਦੇਣਾ ਚਾਹਿਦਾ ਹੈ.ਇਸ ਤੋ ਇਲਾਵਾ ਭਾਰਤ ਸਰਕਾਰ ਨੂੰ ਇਸ ਘਟਨਾ ਨੂੰ ਗੰਭੀਰਤਾ ਨਾਲ ਲੈਦੇ ਹੋਏ ਆਪਣੇ ਪੱਧਰ ਤੇ ਇਹ ਮਸਲਾ ਤੁਰੰਤ ਪਾਕਿ ਸਰਕਾਰ ਨਾਲ ਸਾਝਾ ਕਰਨਾ ਚਾਹਿਦਾ ਹੈ ਤਾਕਿ ਉਸ ਏਰੀਆ ਵਿੱਚ ਵੱਸਦੇ ਘੱਟ ਗਿਣਤੀ ਸਿੱਖ ਪਰਿਵਾਰਾ ਦੀ ਜਾਨ ਅਤੇ ਮਾਲ ਦੀ ਰਖਿੱਆ ਕੀਤੀ ਜਾਵੇ ,ਅਤੇ ਸਿੱਖਾ ਦੇ ਪਵਿੱਤਰ ਧਾਰਮਿਕ ਅਸਖਾਨ ਨਨਕਾਣਾ ਸਾਹਿਬ ਦੁਆਲੇ ਸੁਰਖਿਆ ਵਧਾਈ ਜਾਵੇ. Re: Indian Sellout at Historic Meeting of our PM with PAK President. on the issue of Kashmir but this time Pres. Musharraf uttered the words JAMMU & KASHMIR and we all mindlessly and shamelessly agreed and repeated his words that dialogue on JAMMU & KASHMIR is necessary! Indirectly India also accepted that JAMMU is also included in the disputed matter and disputed territory which was hitherto NEVER a matter of controversy. I sincerely urge you to kindly raise this issue with our Government of the blunder they have commited so that remedial measures are taken at once and dignity and sovereignty of our Nation is kept intact. ਰੁਪਿੰਦਰ ਜੀ ਦਾ ਔਰਗਨ ਸਰਕਾਰ ਦਾ ਪਤਾ ਦੇਣ ਲਈ ਬਹੁਤ ਬਹੁਤ ਸ਼ੁਕਰੀਆ ! thanks staff and editor of this punjabi site for doing such a nice jobb for punjabis and providing pure punjabi culture information&news for punjabis residing out side punjab and abroad. i am typicial punjabi girl established newly in tatanagar(bihar) . Even though tata nagar is full of punjabi people but it is not easy task to be known with them . thanks 5abi.com to quite off boring ness of myself and to keep touch with punjabi culture and news in punjabi. It is very nice and interesting to read about interests of punjabis residing abroad through special articles of cultural programmes and sports organization&festivals reports . long live 5abi.com &punjabi culture &punjabiyat. I have noticed with discomfort with pictures showing Bush and Manmohan Singh together shaking hands and smiling for the camera leaving the impression as if Manmohan gains in stature by shaking hands with Bush. Unfortunately, the reverse is more true. It is Bush who should be honored by being close to Manmohan Singh and it should be Mr. Bush who should be the one gaining in stature by shaking hands with a man of stature higher than himself. Manmohan Singh has, since assuming office, shown that he sticks to his noble principles contrary to those of Mr.Bush. My head sticks high seeing Mr. Singh as a picture of confidence and assurance which Mr. Bush lacks for all his photo op. smiles. We should be proud of ,and rightly so, Mr.Manmohan Singh who is representing India in true spirit of its tradition and culture. Bush, compared with him looks like a factitious man with factitious smile and factitious confidence. After all, he is responsible for bloody mess created by his nefarious policies and practices in relation to the people of Iraq. Whatever Mr. Bush may say, his deeds speak louder. An unelected President who has made the whole world unsafe since he turned president after 9.11 tragedy.Mr. Manmohan Singh, instead, is a person true to his salt where as Mr.. Bush has proved himself a wolf in mans' skin. Hats off to Mr. Manmohan Singh, a man among men on the scene of world political figures.